Tianjin stands as one of China's largest metropolises, combining modern flourishes with preserved history and traditions to create a diverse city. 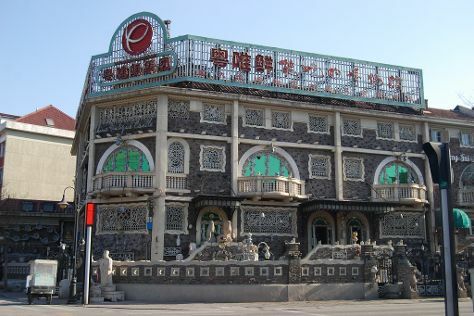 Kick off your visit on the 22nd (Sun): cruise along Five Great Avenues, admire the landmark architecture of China Porcelain House Museum, then don't miss a visit to Ancient Culture Street (Gu Wenhua Jie), and finally make a trip to Ferris wheel, Eye of Tianjin. For more things to do, where to stay, reviews, and tourist information, use the Tianjin road trip website . Singapore, Singapore to Tianjin is an approximately 15.5-hour flight. You can also drive. In April, Tianjin is colder than Singapore - with highs of 24°C and lows of 10°C. Finish up your sightseeing early on the 23rd (Mon) so you can travel to Beijing. Explore hidden gems such as Pinggu Jiangjunguan Great Wall and Back Lakes (Hou Hai). There's still lots to do: contemplate the long history of The Great wall of Jiankou-The Great Wall Alternative, admire the landmark architecture of Hall of Supreme Harmony, stop by Nanluoguxiang, and explore the ancient world of The Great Wall at Badaling. To find where to stay, maps, photos, and more tourist information, read Beijing road trip tool . Traveling by combination of subway and train from Tianjin to Beijing takes an hour. Alternatively, you can drive; or take a train. In April in Beijing, expect temperatures between 24°C during the day and 9°C at night. Wrap up your sightseeing by early afternoon on the 28th (Sat) to allow enough time to travel back home.